Learn to make authentic Italian food from the people behind Marylebone’s Caldesi. The menu proudly boasts: “Our staff originates from eleven out of the twenty-one regions of Italy”. 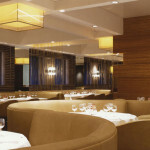 A relaxing atmosphere with easy listening jazz and impeccable service, with a global cuisine that blends east and west.